Midfielder Steven Defour declared that it would be such a waste if the Clarets were to blow their positive start to the Premier League campaign. 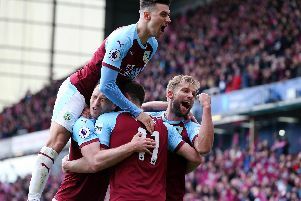 Despite picking up just three points from their last six games Burnley remain seventh in the top flight, five points short of Arsenal in sixth and seven points clear of Everton in ninth. The Belgium international doesn’t want to see the season fizzle out and is determined to get the club back to winning ways as soon as possible. “Of course there’s no need to panic,” he said. “ We deserve the points that we have so we just have to keep on working. “We had a little bit of bad luck against Manchester United and Liverpool so we could easily have had more points but that’s just the way it is. It would be such a waste to have such a good start and then end up just above the relegation zone. “We want to make the fans proud by finishing as high as possible. The 29-year-old, who has started every top flight fixture so far, stated that the Clarets can’t afford to play in fits and starts if they’re to preserve their current standing in the division, adding that the result against Crystal Palace was a rude awakening for the players. Defour said: “I think we were much better in the second half and we had a really good chance through Barnesy to come away with a really good point but our first half performance wasn’t good enough. “We showed good character in the second half but we’ve got to try and show it all the way through. “The gaffer said at half-time ‘nothing comes easy’ and maybe we were taking it easier because we’re seventh in the league. “There are no bad teams in this league so we have to be 100% all the time. That’s what the first half showed us.